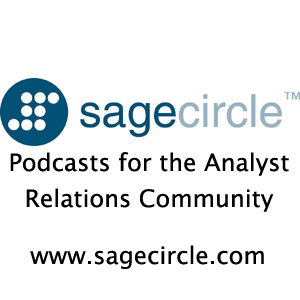 It is with great pleasure that we announce the launch of SageCircle’s newest free research deliverable, the SageCircle AR Community Podcast. The AR podcast is a review of the latest news and trends in the analyst ecosystem along with tips and tricks for analyst relations professionals and analyst research consumers. SageCircle strategists Dave Eckert and Carter Lusher co-host this bi-weekly program. You can find all the SageCircle podcasts on our podcast page. Our goals for the AR Community Podcast are two-fold. The first goal is to provide an additional venue for SageCircle research that complements our existing deliverables, whether free (e.g., SageCircle blog) or client only (e.g., the Online SageContent Library, the largest and premier repository of AR best practices and downloadable tools available in the industry). The second goal is to develop real-world podcasting skills so when our clients are considering their own podcasts we have the experience (and scar tissue) to help them start podcasting without having to re-invent the wheel. Click here to listen to the podcast on your computer (corrected broken link 5/26/09 1:45 pm PT) or visit the podcast page to download the MP3 file. At this time the AR podcast is not yet available for subscription on iTunes, but we hope to have the details for this ironed out by next week. SCP 1: Table of contents. Numbers in parentheses refer to minutes:seconds when the article starts within the podcast. (00:56) This week we start with a look at the Q1 09 earnings reports of the only two publicly held analyst firms, Gartner and Forrester. Gartner surprised us by actually growing overall revenue. Forrester did not. (04:55) Next we’ll discuss our new survey of the analysts on their and AR’s use of social media. (09:04) What is a spoken word audit? Dave provides a definition. (15:39) Our blog post about how Gartner’s Ombudsman called out a vendor on violating copyrighted material drew a number of comments supporting Gartner. (19:16) We wrap up by looking at upcoming AR events. Bottom Line: Podcasting can be a useful part of an AR programs communications toolbox, because it adds both a personal touch and convenience for the analysts. Thanks for the feedback. This is going to be a bi-weekly podcast with the next episode coming out on Tuesday. Any suggestions on how to make it better are greatly appreciated.